French President Jacques Chirac has announced that the new youth employment law that sparked weeks of sometimes violent protests will be scrapped. He said it would be replaced by other measures to tackle youth unemployment. Millions of students and union members have taken to the streets over the last month in protest against the law, which made it easier to fire young workers. Union and student leaders said it was a "great victory" but it is not clear if protests set for Tuesday are still on. The law introduced a new work contract, known as the First Employment Contract or CPE for under-26s. It was to allow a two-year trial period, during which employers could end a contract without explanation. The plan to replace the CPE was announced after a meeting between the president, Prime Minister Dominique de Villepin and other senior ministers on Monday. The new package of measures includes offering state support for employers hiring young people who face the most difficulties in gaining access to the labour market. It was being submitted to parliament on Monday and is expected to be voted on in the next few days. 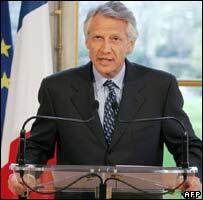 Speaking in a live television address, Mr de Villepin said the president had accepted his proposed changes. The prime minister said he was convinced that the only way of addressing joblessness in France was a better balance between flexibility for employers and security for employees. "For some time the action of the government had been guided by one objective, to provide thousands of young people from our society with opportunities for jobs," he said. "I wanted to act very quickly because the dramatic situation and the despair of a number of young people warranted it. "This was not understood by everyone, I'm sorry to say," said Mr de Villepin, who saw his poll ratings decline during the two-month crisis. The BBC's Alasdair Sandford in Paris says it is a significant climbdown for the French government and is particularly humiliating for Mr de Villepin who had staked much of his personal credibility on the measure. Union leaders had given the government until Easter weekend to withdraw the law or face a repeat of the recent general strikes. Student leader Julie Coudry called for protesters to lift blockades at dozens of universities so students could prepare for their end-of-year exams. 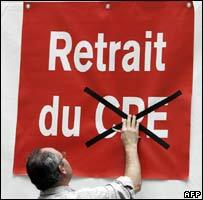 "The CPE is dead, the CPE is well and truly finished," she said. But some students appeared unwilling to abandon their protest. Many had wanted the entire law to be revoked, not just the article introducing the employment contract. "Our demands have not really been met," Lise Prunier, a student at the University of Paris-Jussieu told the Associated Press. Was it right to scrap labour law?